Meeting one of Kyoto’s geisha is a magical and memorable experience. Here, I’ll tell you all about them, where to find them and how to enjoy geisha entertainment – on any budget. Geisha are highly skilled entertainers who appear at high-end dinners, private parties and special events to add a special touch to the proceedings. They are NOT prostitutes, despite various silly rumors and portrayals in certain books and movies. Rather, they are ladies who have trained for years in the traditional Japanese arts to become the perfect entertainers. Kyoto is the heart of Japan’s geisha world. 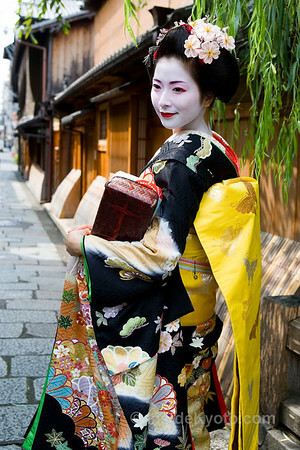 In Kyoto, however, fully-fledged geisha are properly called geiko (pronounced “gay-ko”). Young ladies, usually between the ages of 15 and 20, train for five years to become a geiko. During this period, they are known as maiko (pronounced “my-ko”). 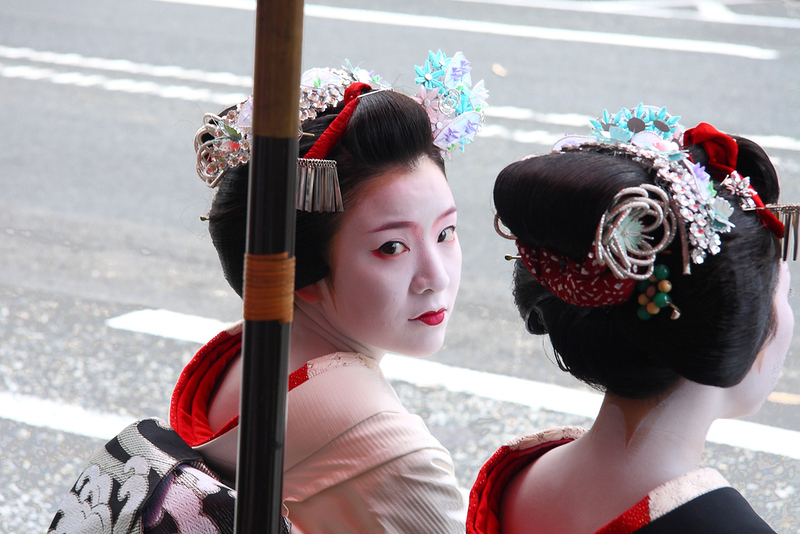 Knowledgeable insiders estimate that there are about 100 geiko and 100 maiko in Kyoto. 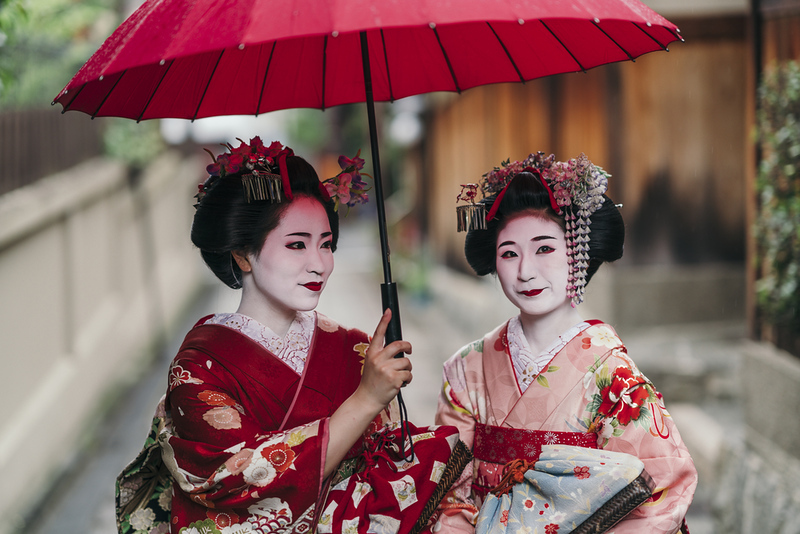 Other cities, like Tokyo, have some version of geisha, but they don’t usually undergo the strict training that defines Kyoto’s maiko and geiko. What’s The Difference Between a Maiko and a Geiko? It’s easy to tell the difference between a maiko and a geiko: maiko wear colorful kimono with long sleeves and appear with their own hair worn up with a variety of extravagant hairpins (known as kanzashi), while geiko wear plainer kimono with shorter sleeves and appear wearing relatively unadorned wigs. Both maiko and geiko entertain guests and they often appear together at various functions. Maiko usually live at their okiya (geisha house) during their training period, under the care of a kami-san (mother of the house). During this time, they are not supposed to enter into romantic relationships or marry. After becoming geiko, they are free to live on their own and some open bars or their own okiya. Some also leave the profession, marry or both. How Much Does Geisha Entertainment Cost? Needless to say, it’s not cheap to arrange experience private geisha entertainment. Dinner for two with one maiko, one geiko and one jikata (shamisen player) for two will cost around US$900, sometimes significantly more, depending upon the restaurant and drinks consumed. Of course, even if you have this money to spend, it doesn’t mean you can just order up a few geisha for your special evening (see the following section). 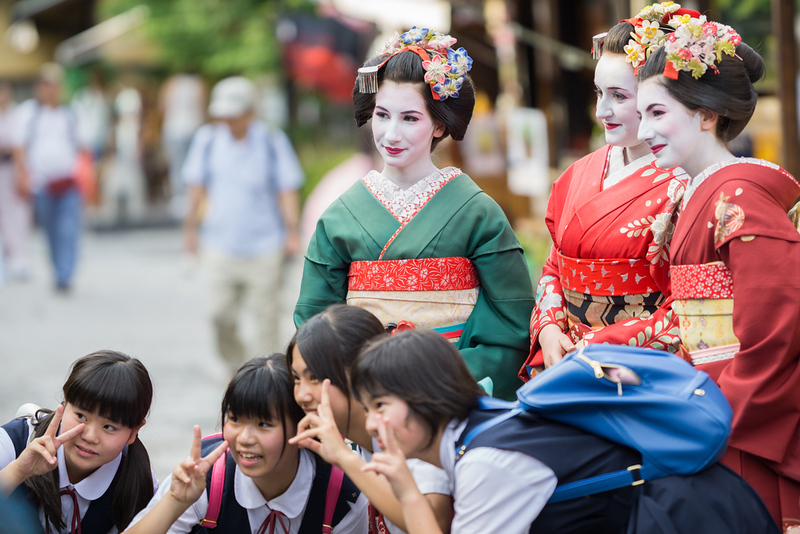 How Can You Arrange Geisha Entertainment in Kyoto? Whether you are Japanese or foreign, you cannot experience geisha entertainment without a personal introduction from an existing client of a particular geisha house. Luckily, my tour company, Chris Rowthorn Tours, can arrange geisha entertainment for our guests. We usually arrange for private dinners at superb kaiseki restaurants, where you dine with the geisha in private rooms, and we supply bilingual interpreters so you can communicate freely with the geisha. In my experience, an evening with geisha is the highlight of my clients’ trips. The price starts at Y70,000 per group, plus Y15,000 to Y20,000 per person for dinner. If this is beyond your budget, don’t worry, there are some cheaper options listed below. What If You Can’t Afford Private Geisha Entertainment? Don’t worry if private geisha entertainment is beyond your means. There are a few cheaper options available in Kyoto. The most famous and well-produced one is the Kyoto Cuisine and Maiko Evening, which is offered by Gion Hatanaka ryokan. Here, you eat dinner with a small group of other people and are entertained by several geisha, who demonstrate their dancing and also play a few drinking games with the guests. The geisha circulate during the meal so you can talk directly to them. It’s well done and a lot of fun. What About Kyoto’s Geisha Dances? Miyako Odori (held daily in April): The biggest and most spectacular geisha dance in Kyoto, put on by the geisha of the Gion Kobu geisha district. Don’t miss it! Kyō Odori (held daily first to third Sunday in April): The second biggest geisha dance in Kyoto (after the above), this is another spectacular dance that is not to be missed. It’s put on by the geisha of the Miyagawa-cho geisha district. Kitano Odori (held daily between 15 and 25 April): A lovely dance in intimate surroundings put on the by geisha of the Kamishichiken geisha district, in the northwest of town. Highly recommended. Kamogawa Odori (held daily between 1 and 24 May): A fine performance put on by the geisha of the Pontocho geisha district. Gion Odori (held daily between 1 and 10 November): A cute dance in a smaller venue than the above dances. It’s put on by the geisha of the Gion Higashi geisha district. 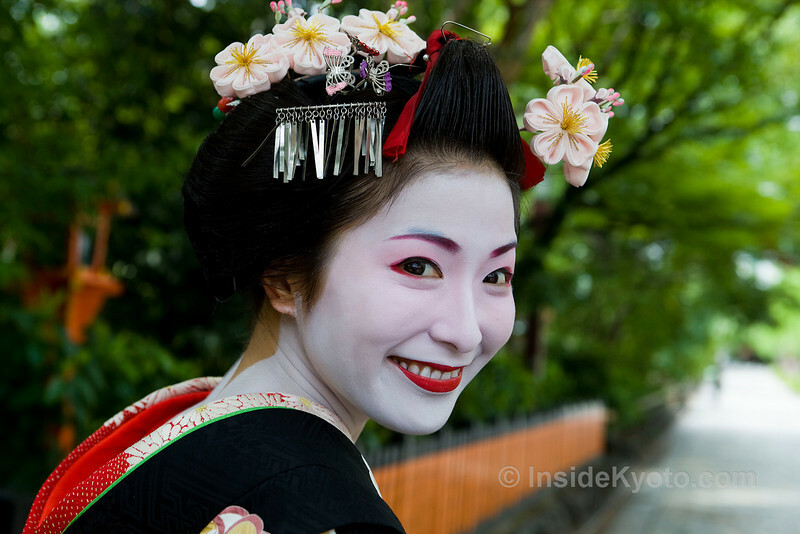 Where Can You See Geisha in Kyoto? Even if you cannot catch a geisha dance or afford geisha entertainment, you can still see geisha in Kyoto. Before I tell you where, however, please understand that Kyoto’s geisha have been finding it really difficult to deal with the hordes of “geisha spotters” who prowl their districts trying to get a glimpse or a photo of them. It’s really important to keep in mind that the geisha you see in the geisha districts are usually on their way to an appointment and they cannot stop for a photo. But, more importantly, please remember that these geisha – just like most people – don’t appreciate being mobbed by strangers. Please treat the geisha with respect and do not impede their progress! The best places to see geisha in Kyoto are Hanami-koji-dori in Gion (the section between Shijo-dori and Kennin-ji Temple) and at the Shijo-dori end of Pontocho. The best time to see them is around dusk (early evening), especially on weekends and holidays. You probably won’t see any on Monday evenings. 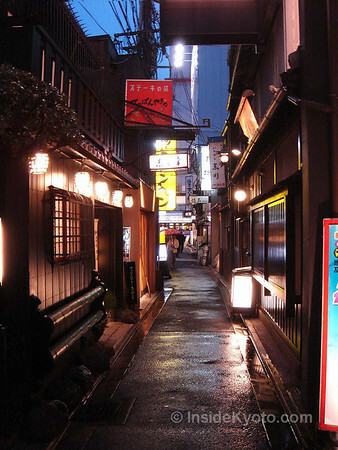 A great way to explore these districts and learn about geisha is to take the Gion Evening Walk offered by my company. Can You Be Made Up and Dressed As a Geisha? If you’d like to try being a geisha for a few hours, several places in Kyoto offer “maiko henshin” (maiko transformation) service. These places will do your makeup and dress you in full geisha kimono etc and then, if you wish, take your picture in some of Kyoto’s most scenic spots. A good place for this is MAICA, which is located in the Miyagawa-cho geisha district. 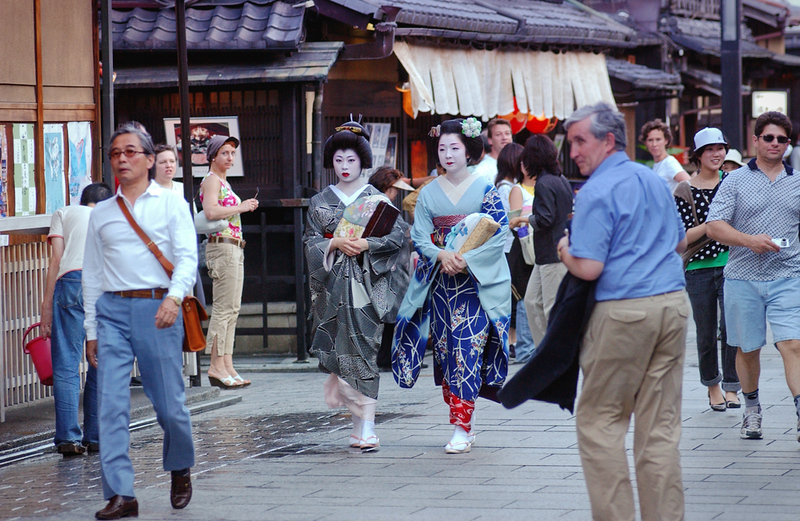 What If You See a Geisha in the Daytime in Sightseeing Districts? Finally, you might spot a woman who looks like a geisha wandering around in the daytime in some of Kyoto’s famous sightseeing districts (particularly Southern Higashiyama). Don’t get too excited – these are almost certainly tourists who have paid to be made up and dressed like geisha (see above). However, they’re usually beautiful and more willing than real geisha to pose for photos – your friends at home will never know the difference!